A prerequisite to manage farms in line with the sustainability concept is to be aware of the potential impact of farming practices on environmental and social issues. 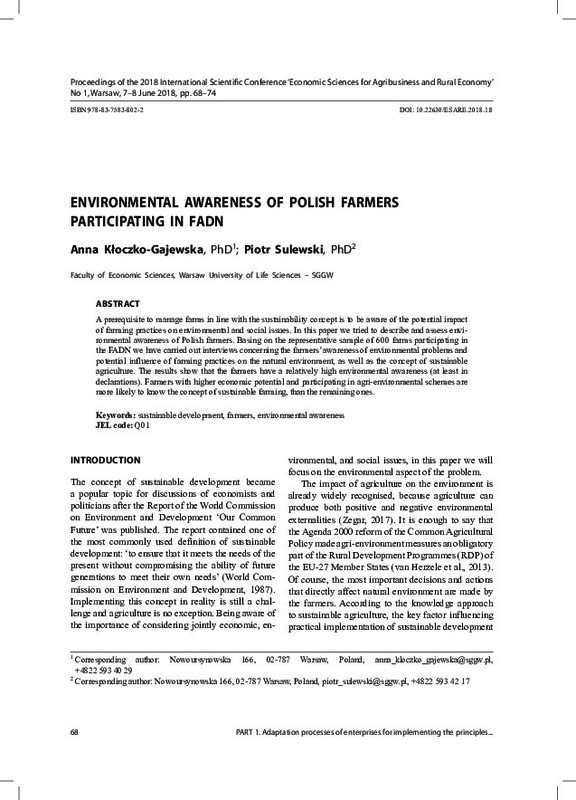 In this paper we tried to describe and assess environmental awareness of Polish farmers. Basing on the representative sample of 600 farms participating in the FADN we have carried out interviews concerning the farmers’ awareness of environmental problems and potential influence of farming practices on the natural environment, as well as the concept of sustainable agriculture. The results show that the farmers have a relatively high environmental awareness (at least in declarations). Farmers with higher economic potential and participating in agri-environmental schemes are more likely to know the concept of sustainable farming, than the remaining ones.